How do hungry caterpillars find food? How does a caterpillar find its food? What do they eat and which senses do they use to find it? Ask students to think about how the caterpillars might find their favorite foods. Have them consider their own senses and how they find their own favorite foods. Ask your scientist to create a testable question. Example: Do caterpillars use their sense of sight to decide which leaves to eat? Introduce the caterpillars & review the Tomato Hornworms handout. Have students observe how the caterpillar moves. Have students determine the age of their caterpillar(s) using the chart on the Tomato Hornworms handout. Record information on the Hungry Caterpillar Data Collection Sheet. Set up a choice test for caterpillars to choose between two leaves. Set the leaves 6-8 inches apart. Carefully place the caterpillar between them. Students should determine which leaves are the caterpillars’ favorite. Discuss with the student that some insects are generalists (meaning they eat many types of plants) and some are specialists (meaning they eat only a few specific types of plants.) These caterpillars are specialists and only eat certain kinds of plants. Experiment to determine how the caterpillar knows it’s the food they want. Ask your student how we could test each sense independently. To test location, switch the position of the leaves. Did the caterpillars still find their favorite leaf? Record the results on the Hungry Caterpillar Data Collection Sheet. 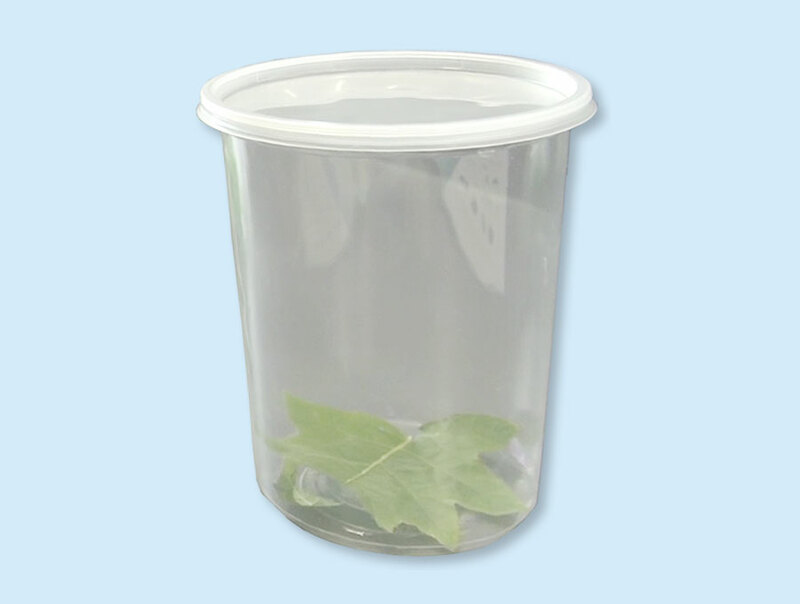 To test vision, cover the leaves with a clear plastic container, so the leaves are visible, but caterpillars can’t smell them. To test smell, cover the leaves with fabric mesh, so the caterpillars can smell them, but the leaves are not visible. Based on their results, ask the students which sense the caterpillars use to find their favorite leaves. Which senses do YOU use to identify your favorite foods? Depends on the scientist, but if you’re like most people, you use a combination of your sense of sight, smell, and taste to determine which foods you think are yummy! Observe your caterpillars. How do caterpillars move? They crawl from back to front in waves using their belly - watch them closely, it’s so cool! Which plants do the caterpillars like best? These caterpillars love tomatoes, potatoes, peppers, and eggplants. Just like us! How can we test each sense independently? We can test this by changing the cues the caterpillars can detect. If we move the plants, we can see the location of the plants doesn’t matter. The caterpillars can still find the correct plants. If we cover the plants with a clear plastic jar, the caterpillar can see the plants without smelling the plants. Now the caterpillars can’t find the correct plants. Finally, if we hide the plants with mesh fabric, the caterpillars can’t see the plants, but they can still smell them. Which senses do the caterpillars use to find their favorite food? Your experiment results should have resulted in the caterpillars using their sense of smell to locate the solanaceous leaves. Manduca, or Tomato Hornworms, are very hungry caterpillars. They can eat 64 square inches a day. That’s about the size of a paper plate! All of that eating gives them enough energy to grow into adult Hawkmoths. But first they have to locate their favorite foods: solanaceous plants. Manduca love tomatoes, potatoes, peppers, and eggplants. Just like us! So how do they do it? They smell them! Manduca have a better sense of smell than dogs. Turns out caterpillars have simple eyes (ocelli) which can only differentiate dark from light. They cannot form an image. The tiny antennae, near the mouth parts, sense smells. Some sources describe their sense of smell as a combination of taste and smell. The caterpillars will choose the solanaceous plants if they can smell them, telling us they used their sense of smell to find their favorite food! Sometimes referred to as “feelers,” insects use these appendages for sensing. Also called caterpillar, it’s the early life phase of a moth. The sharp jaws of a larva used to chew leaves. A scientific term for simple eyes. Insects that are picky eaters and only eat a few types of plants. Insects that eat many different kinds of plants. A plant family that includes tomatoes, potatoes, peppers, and eggplants.